The ability to analyze charts and tables is a necessary skill for succeeding on the GED Social Studies test. One special feature of charts is that they allow you to make predictions based on the trends they show. The slopes of the lines can tell you what may happen in the future simply by extending the lines. 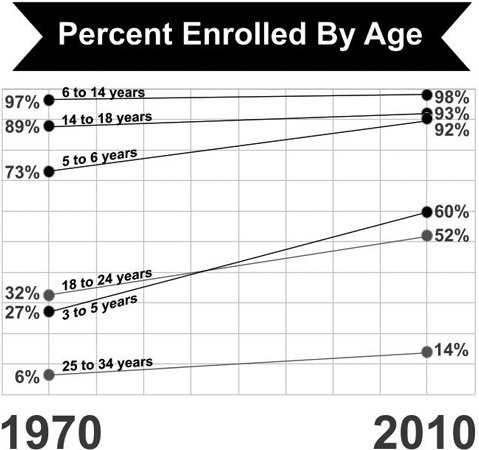 This chart shows trends in educational enrollment. Chart showing trends in educational enrollment. What will be the approximate percentage of people ages 25 to 34 enrolled in some form of education by 2050? The trend is upward, so you know it will increase. The percentage increase between 1970 and 2010 slightly more than doubled from 6 to 14 percent. In another 40 years, you can project that the percentage will slightly more than double again. Doubling 14 percent gives you 28 percent, so Choice (C) is definitely wrong. The answer you’re looking for is slightly more than doubled, which describes 30 percent (Choice (B)) but isn’t even close to 70 percent (Choice (A)). Choice (B) is the correct answer. However, this projection assumes the trend will continue at the same rate over 40 years, which is a big assumption. Making projections on so little data without the ability to verify is risky. However, in terms of the Social Studies test, it’s acceptable. You can also use numbers on tables to predict trends based on past experience. This table from the U.S. Census Bureau is an example. Chart showing year-to-year numbers of mothers who were never married. What trend does this table show? (A) Fewer women are getting married. (B) More women are having children outside marriage. (C) Women in the 45-to-50 age group are less likely to have children outside marriage. The correct answer is Choice (D), all of the above. The first three choices are obvious from the numbers. Between 1990 and 2014, the total of never-married women and the number of never-married mothers increased. However, when you include the 45-to-50 age group, you see a slight decline in the number of never-married mothers. That suggests that women in that age group are less likely to have children outside marriage. This data is also suitable for other mathematical calculations. For example, you may want to know the average percentage of never-married mothers in the period between 2014 and 1990. Simply add up all the percentages in that column. You’d find that the average over that period is 22.45 percent.